Leverage your POS sales history to drive revenue, control costs & increase profit. 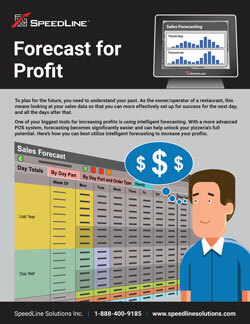 An infographic view of a week's sales forecast shows you how to apply the detail in your POS sales forecast to achieve cost targets. Luigi's Pizza owner, Chris Jordan, explains how he and his restaurant managers apply sales forecasting to prep and labor planning in two Branson, Missouri pizzerias with highly variable seasonal sales.